The commander is in England. The drone pilot is in America. The terrorist is in Kenya. And the authority to strike is up in the air. 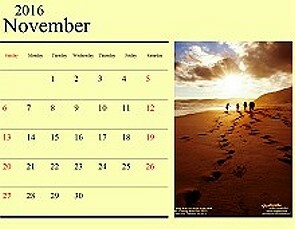 Viet Nam was the first war that was televised. Soldiers came back from the war to be vilified for their cruelty. We have since become drenched in still images and moving images until it requires something 'hot' to make the news (see Whiskey Tango Foxtrot). Increasingly we are living in the push-button-war era. Not only are the politicians and the commanders giving orders from safely behind the lines, but the pilots and the targeteers are safely at home too. Eye in the Sky is war in a time of drones and remote control warfare. A time when we have seen mistakes take out civilian targets, through error or bad intelligence. 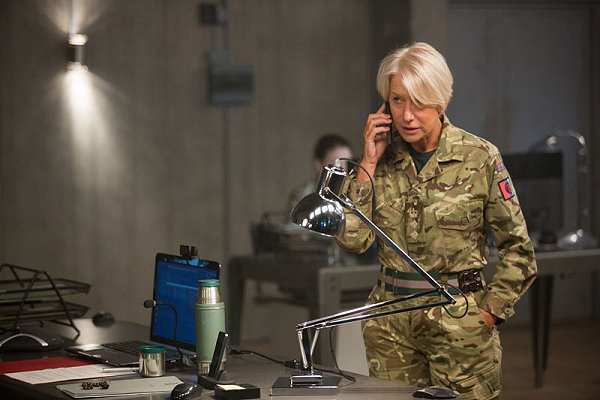 British Colonel Katherine Powell (Helen Mirren) is in command of a mission to kill terrorists on the official 'hit' list. Two of the targets are British citizens, one a U.S. citizen. In a bare concrete room with a minimum of screens and a small staff (including the targeteer) she is leading a multinational team on three continents. 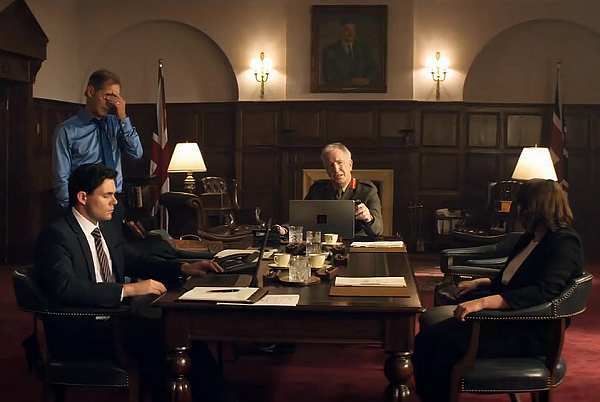 Lieutenant General Frank Benson (Alan Rickman) is her superior, sitting in a wood-panelled meeting room with a group of politicians. Across the pond, Lt. 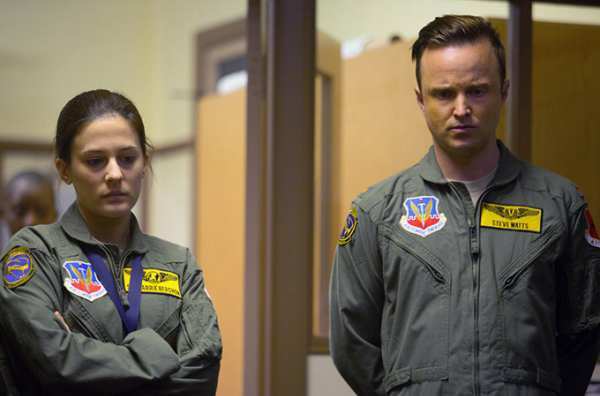 Colonel Ed Walsh (director Gavin Wood) sits in a dull military office with an underling on a notebook, and his pilot and sensor officer (Aaron Paul and Phoebe Fox) are outside on the Nevada base in a unit about the size of a trailer filled with tech. 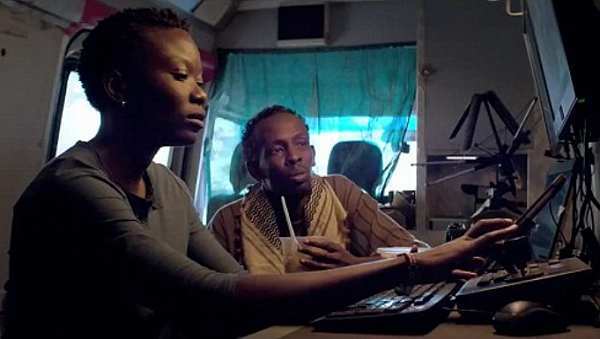 In Kenya a male (Barkhad Abdi) and female local operate small surveillance cameras from a battered van, and ultimately must take any necessary action on the ground. 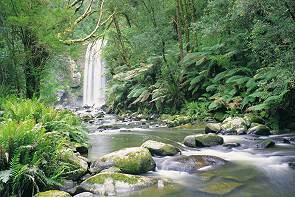 This film is a modern warfare film, where decision makers watch from afar, but can zoom in on an image. They can confirm the identity of the target. They can calculate possible collateral damage. And they can see a pre-teen girl, who we know is secretly learning to read and secretly playing, as she sells the bread her mother baked. There are well-drawn and well-played characters in this film. As the film progresses we see the potential human cost, and the real human cost of killing from afar. Never tell a soldier that he does not know the cost of war. Perhaps this film is more a political thriller than a war film, because it highlights the protocols and the legal hoops that are involved in such targetted death. 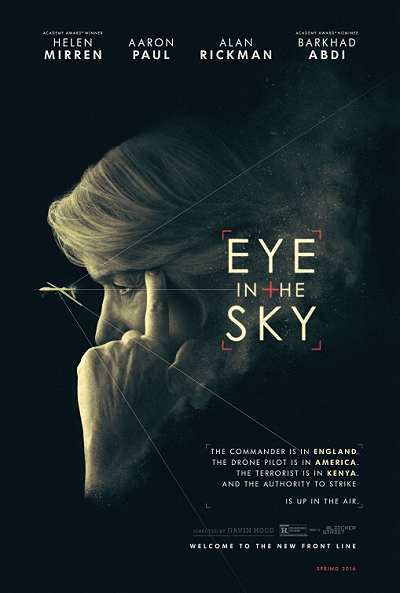 Eye in the Sky starts slowly and builds suspense as we observe, and feel, the frustrations and heart-burnings of the characters. Mirren is superb as always and Rickman is understatedly brilliant, reminding us how much he will be missed. Jeremy Northam is a convincing vacillating politician who must 'refer up'. But in this war there are no small characters. If you want a film with intelligent writing, thoughtful direction and acting, and something to think about and discuss later, this is for you. A window into a hidden world.